Part of the Department of the Treasury, the Federal Financing Bank (FFB) seeks to reduce the cost of federal borrowing. Created during a period of competition between government-backed and Treasury securities, the FFB maintains the authority to purchase any financial obligation issued, sold or guaranteed by a federal agency to ensure that these obligations are financed appropriately. Much of the FFB’s work is performed outside the US budget, which has led some to nickname the institution a “ghost bank.” The FFB has helped finance a wide array of government operations, from agricultural to military programs. Recently, lawmakers seeking solutions to the student loan crisis have advocated for the FFB to help, much to the displeasure of President George W. Bush. During the late 1960s and early 1970s, there was a dramatic increase in the number and volume of securities offered in the government securities market by federal agencies or borrowers with federal guarantees. This strained the capacity of the government securities market. Part of the problem was that newer securities traded at wider spreads and higher interest rates than those regularly marketed by the Treasury Department. In addition, agencies and guaranteed borrowers found it more expensive to finance their securities because of the administrative costs of maintaining a staff and underwriting costs. 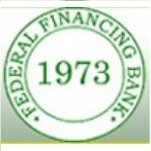 To lower the borrowing costs of agency-issued and agency-guaranteed securities, the Federal Financing Bank was established in 1973 as a central financing authority for marketable federal securities (exempting those the Treasury borrowed on its own). At its inception, the FFB was given the authority to borrow up to $15 billion through the issuance of its own debt and unlimited authority to borrow from the Treasury. Although it was originally thought that the FFB would finance its activities through issuance of its debt, treasury officials managing the FFB found it cheaper to borrow directly from the Treasury. The bank borrows at the Treasury’s current rates and lends to agencies and agency-guaranteed borrowers at the Treasury rate plus one-eighth of a percentage point. Because this rate is around one half of a percentage point below what borrowers would have to pay if they offered their securities in the market, they save millions of dollars by borrowing them from the FFB. Since the FFB’s inception, it has bought almost all debt issues and certificates of beneficial ownership offered by federal agencies. It has become a major source of financing for the securities of guaranteed borrowers that otherwise would be sold in the government securities market. At first, it was anticipated that the FFB would lend around $6-7 million annually. But during 1975, the FFB’s first full year of operations, it made new loans in the amount of $12.7 million. One of the big stories of 1979 was Chrysler Corporation’s seeking a government loan guarantee to prevent plant closures and massive layoffs. However, when Western Union approached the federal government for a $650 million loan, it was not reported in the mainstream media. It began when NASA wanted to build the Tracking and Data Relay System Satellite (TDRSS) to help track other satellites. Suspecting that Congress wouldn’t appropriate the $750 billion need to move the project forward, NASA tried to get a private corporation to develop TDRSS by guaranteeing that it would lease back part of the satellite to pay back the construction loan. At the same time, the builder would use or lease the other part of the system for a profit. The contracting company, Western Union, couldn’t get a loan of that size through a private bank, unless the government guaranteed it. Instead, Western Union went to the FFB and received its funds. Forbes magazine has called the FBB a “ghost bank” because its extremely large transactions often go unreported in the media. Over the years, the FFB has been a success as a debt management and financing tool, but it has also raised two main problems. The first is that direct loans are not counted in the borrowing agency’s budget or the full US government budget totals. Instead, they appear in the FFB’s budget, which is called off-budget because the numbers don’t show up in the federal government’s annual accounting. Because of this, agency budget totals and budget deficits are understated by the amount of financing that the agency has borrowed from the FFB and FFB direct loans to the guaranteed borrowers. This creates a second problem, which is that resources may be over-allocated to activities financed through the FFB. Because of these potential dangers stemming from off-budget financing, some experts have suggested abolishing the FFB. Others have suggested putting the FFB on-budget. The Federal Financing Act of 1981 repealed the statutory exclusion of the FFB from the unified budget. The Federal Financing Bank (FFB) is a government corporation that functions under the general supervision of the Secretary of the Treasury. The FFB was established to centralize and reduce the cost of federal borrowing as well as federally-assisted borrowing from the public. The FFB deals with federal budget management issues which occur when off-budget financing floods the government securities market with offers of a variety of government-backed securities that are competing with Treasury securities. Today, the FFB has statutory authority to purchase any obligation issued, sold or guaranteed by a federal agency to ensure that fully guaranteed obligations are financed efficiently. Agency Debt: Agencies with authority from Congress to borrow to finance their activities sell their own debt securities in the same manner that the Treasury offers bonds, notes and bills to finance the government’s deficit. Certificates of Beneficial Ownership: Federal agencies that make direct loans pool a number of loans together and then sell certificates representing a share in that loan pool. These certificates of beneficial ownership (CBOs) can be sold in larger units than individual loans and are guaranteed by the selling agency. By selling CBOs, the lending agencies can refinance their loan portfolios, in effect generating new capital for further loans. Guaranteed Securities: To allow nonfederal enterprises to tap the government securities market as a source of financing, some agencies fully guarantee the repayment of interest and principal on securities issued by these enterprises. This approach evolved as the size of projects proposed for guaranteed financing grew larger and as banks and other lending institutions became more hesitant to make long-term large commercial loans for these ventures. The FFB has a board of directors consisting of the Treasury Department’s secretary, deputy secretary, under secretary for domestic finance, general counsel and the fiscal assistant secretary. The staff of the bank is organized into three sections: loan administration; loan accounting; and computer support. The loan administration manager reports to the bank’s chief financial officer (CFO) and is responsible for overseeing duties related to credit analysis, loan origination, loan structuring and customer service. The accounting manager oversees loan disbursements, accounting for loan repayments and financial reporting. The CFO also functions as the bank’s chief information officer in charge of the bank’s information technology systems. In the spring of 2008, news reports told how the credit crunch affecting the housing and other financial markets had started to hit college campuses. Dozens of lenders, representing about 13% of the student loan market, had stopped offering federally guaranteed student loans. By May, Congress enacted legislation to bolster the student loan market. But higher education experts worried that lawmakers had not done enough to prevent a crisis for the new school year starting in September. Lenders, along with Senator Christopher Dodd (D-CT), sought another direct lifeline from the Federal Financing Bank, asking it to lend money to private banks to finance individual student loans. President George W. Bush objected to this idea, wanting instead to maintain the “limited role” of the FFB. Lawmakers may introduce new legislation, possibly focusing on the FFB, to address the problem. As the director of the Office of Federal Lending, Gary H. Burner also serves as the chief financial officer of the Federal Financing Bank. Prior to holding his current position, Burner served as the chief lending officer for First Niagara Financial Group in 2004.